"The Most Fruitful of All Missionary Work"
Anyone at the Cross Could Have Written That! 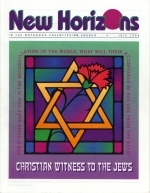 The 1838 General Assembly of the Church of Scotland appointed a four-man team to investigate evangelistic opportunities among Jews in Europe and Palestine. The older men were Dr. Alexander Keith and Dr. Alexander Black, and the younger two ministers were Robert Murray M'Cheyne and Andrew Bonar. On their return, the General Assembly debated at length the question of the most suitable locationeither Pesth (Budapest) or Palestine. Eventually it was agreed that the work should begin in Pesth, and a team of workers led by Dr. John Duncan was appointed. Does God still have a plan for the Jewish people? Does he have a design that continues to this very dayand beyond? Or has God cast the Jews aside, rejecting them and replaced them with the church as God's "chosen people"? In my youth, I spent every afternoon studying Hebrew. As I grew older, I worshiped every morning and evening in the synagogue.